(CNSNews.com) - The federal debt officially surpassed $20 trillion for the first time on Friday, as the debt subject to the legal limit set by Congress jumped $317,645,000,000 in one day--following President Donald Trump's signing of a spending-and-debt-limit deal that will fund the government through Dec. 8. That means the total debt jumped $317,590,000,000 on the day it officially topped $20 trillion for the first time and that the part of the debt subject to the legal limit jumped $317,645,000,000 on that day. The data presented on the Treasury Department's "Debt to the Penny" page also shows that Friday was the first time that the total debt of the federal government ever topped $20 trillion. According to the "Debt to the Penny" chart, the highest previous level of the federal debt before Friday was on Dec. 30, 2016, when the total debt hit $19,976,826,951,047.80--just $23,173,948,952.20 below the $20 trillion mark. From March 16 through Sept. 7, every Daily Treasury Statement showed the total federal debt subject to the legal limit opening and closing each day at $19,808,747,000,000. 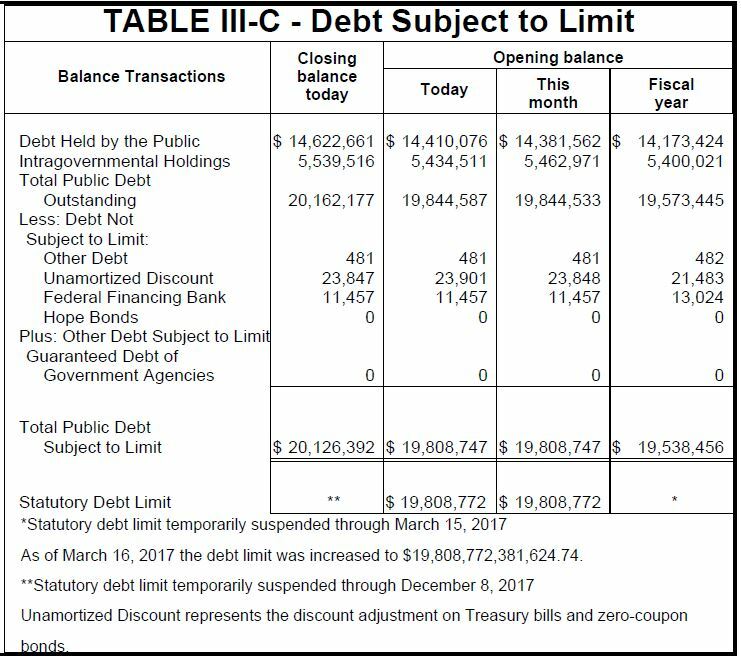 That was because the previous suspension of the debt limit had expired on March 15 and the debt limit had been reset at the level the debt reached at the close of business that day--which was $19,808,772,381,624.74. 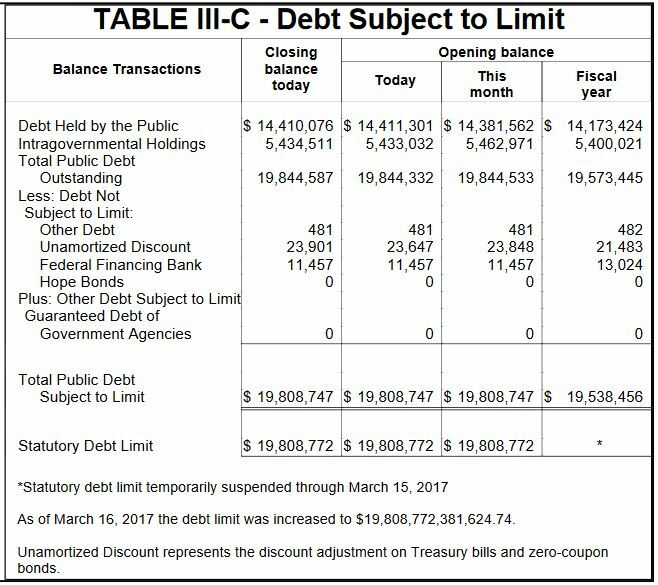 The Treasury then started using what it calls "extraordinary measures" to keep the debt subject to the limit about $25 milion below the limit.